First thing I had to do was bake a top for the silo. 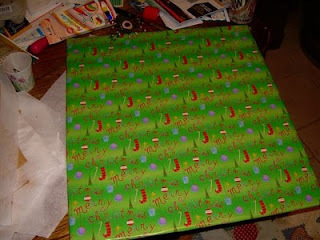 I made one yesterday, but when I was looking over the directions this morning, I realized that I made a huge mistake! 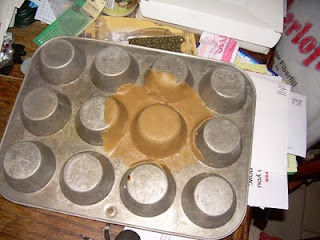 The silo top, unlike all of the other pieces, is a "shaped" piece from a muffin pan. When I made it yesterday, I thoughtlessly put the rolled out gingerbread on the inside of a muffin cup. While reading the directions again this morning to figure out what I would need for today's work, I noticed I had misread the directions. I was supposed to drape the gingerbread on the bottom of the muffin pan, making it just a tad bit bigger. So I pulled out the extra gingerbread I had saved and baked a new top for the silo. Next up--coloring! The directions say that I'm supposed to brush red (or burgundy) food coloring powder onto all of the walls that make up the barn. The problem is, I can't find food coloring powder to save my life. A google search pops up lots of places where I can order it online, but I recklessly chose to wing it by not trying to acquire materials until the day I need them. I don't want to wait several days for an Internet order to arrive, so it was time to improvise. I wandered around the cake decorating section of Michaels this afternoon and purchased a few "coloring options." I didn't really know what would work best, so I bought all of the variations available with the intention of trying them out on the back of a gingerbread piece that wouldn't be visible in the final creation. And that's what you see in this photo. The left side I tested a "food coloring marker"--I didn't even know such a thing existed--but it's supposed to be safe for consumption and therefore fair game for a gingerbread house. On the right I tried a red sprinkle powder. I didn't really expect that to work well since it actually has a "sparkle" to it, but it's not terribly obvious unless you're looking at it with the light in the right direction. 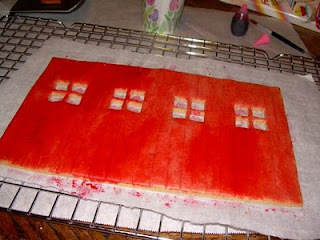 And the bottom of the gingerbread barn I tested regular old, liquid food coloring. I "washed" the area with water, then dropped a single drop of food coloring in it and spread it out. Of all of the tests I did, I decided I liked the results of this one the best, and that's what I used for the front of all of the vital pieces. 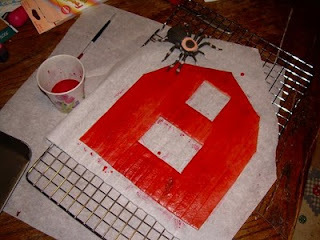 Here's a clearer example of how I turned the barn red. I washed the area with water using a brush. The water was already tinted red from previous tests, but it wasn't dark enough to satisfy me. So I dropped a single drop of the food coloring on it. 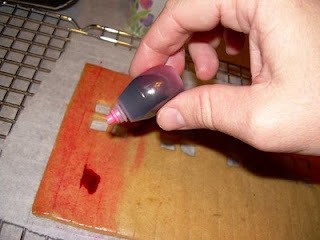 Then use the brush to spread out the color. Repeat as often as necessary to cover the entire piece. And we've got the side of a barn! Here's the front of the barn. The directions in my book talk about humidity being bad for the gingerbread. It absorbs the water the air and doesn't become as stiff and will start to sag faster. I'm working in sunny California, and humidity isn't really a problem. I did, however, just coat the entire surface of these pieces with water. Figuring that couldn't possibly be good for the structural strength of the gingerbread, I threw all of the pieces back into the oven for a few minutes. I want these pieces to be dry! 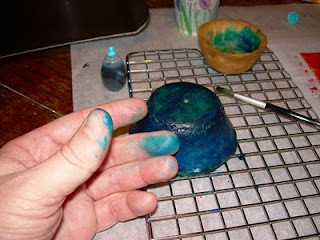 That's probably why the directions wanted me to use food coloring powder. It's already dry. I'm almost ready to start "gluing" all of these pieces together. First, I need glue, which is what I'm making here. The bowl on the left has three egg white. I removed the yolk--I want the royal icing to be white, after all, not yellow! The right bowl is a bunch of powdered sugar. And a dash of creme of tartar, all to be mixed well. I know my mom has an electric mixer, but I'll be darned where she hid it, so I used the manually egg mixer instead. 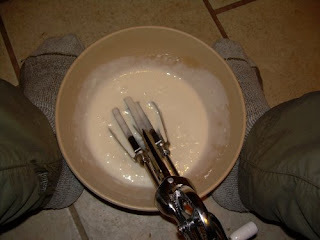 Oddly, I found that using my feet to hold the bowl steady while I worked the hand mixer was easiest. While technically speaking, this gingerbread barn will be completely edible, I don't really expect anyone will actually want to eat it. 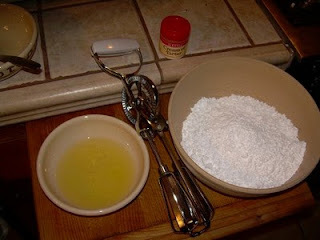 The recipes for creating gingerbread and icing are focused more on their practical use than taste. There's a different icing recipe I use for making cakes, for instance, which tastes a heck of a lot better than this stuff. And after everything sits out for several days, the food will likely be pretty stale. The gingerbread barn will technically be edible, but it won't be good to eat. Next up, I need a place to set up my little gingerbread barn. I found this board lying around and thought, "Yes, that will do perfectly." And that's where I'm at now. Next episode, a real-life barn raising! For next year...Wilton makes a food coloring paste which is much more concentrated than the regular liquid food coloring. It would probably work very well for painting gingerbread and require a lot less water. You can usually find in about anywhere Wilton products are sold. 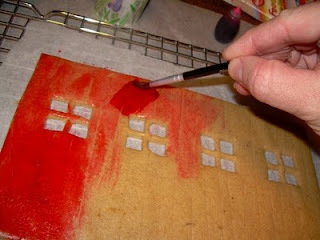 I have food coloring paste readily available, but it seems hard to "paint" with the paste. Much too thick. I'll be using the paste in the icing, though, when it comes to coloring the icing so it doesn't thin it out too much. But where'd the cow go??? (I know... cows go moo) Hope to see tomorrow!! I think you should name the spider "Barney". Brown paper hasn't been printed with ink of questionable safety. I'm thinking your book is a couple decades old? "Brown paper" is something most people had on rolls--used to mail packages and cover school books--and also readily available by using the inside of a brown grocery bag (before handled ones) which everyone had in large quantity. So, it's not the color they wanted, it was an item everyone would have had 'back then'. who know about OLD things. 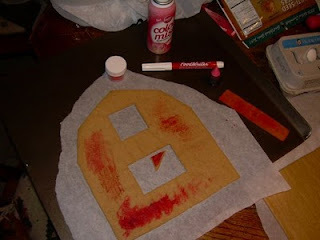 . .
Well since you don't plan for anyone to eat the barn, it shouldn't matter if you are using colored paper. But if you were, the colored paper can bleed ink and the ink isn't very healthy to ingest. 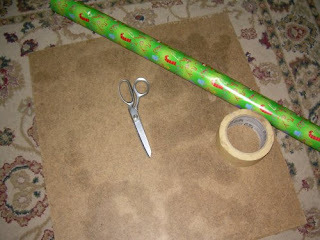 I would also think brown paper is thicker and sturdier than most wrapping paper, too...so it won't shred or become weak once you handle it and it becomes damp from the icing and deocrations. I meant to say in the next post that the idea to use brown sugar as a base was brilliant! Good thing ants aren't around during the winter, though. But you still might need to call pest control. That's a very lage spider you've got there. gah!